Home » Encyclopedia » Encyclopedia C » Child seats. Child seats are indispensable for carrying small children safe and comfortable on the bike. Small children under three years old can – to keep an eye on the child – are best transported in a front seat. As they get older they can be better conveyed in a back seat because they are too heavy to be safe at the steering wheel to transport. 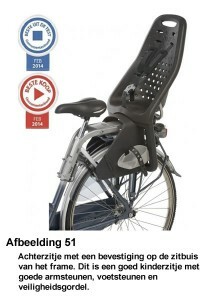 The cyclist is increasingly restricted in his freedom of movement as the child grows. With a seat in the front the child is also full in the wind. A windshield can protect the child from the cold wind. Child seats may be attached to the steering wheel, the frame or the luggage rack. The best confirmation is a good rigid coupling to the frame. An attachment to the steering wheel has an adverse influence on the steering behavior of the bicycle. Most luggage racks are too weak to properly secure a child seat. It is also important that the seat is easy to disassemble. 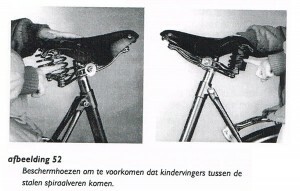 A seat that does not remain on the bike should be easy to dismantle. For a seat that does not have to be disassembled is that not important. To ensure that the child in the seat is safely and comfortably it must have good back support, good foot support and good armrests. The armrests prevent the child from falling on the side of the seat. The steps must be adjustable in length in order to adjust them to the changing leg of the child. In order to prevent the child from sliding forward the seat should be horizontal or slightly backwards be mounted. A seat belt to secure the child is indispensable to prevent the child from falling out of the seat or climbing during transport. The child should not get caught somewhere with the feet or hands. It is best to strap the feet with special foot straps. The fingers may be trapped in a rear carrier between the steel springs of the saddle. 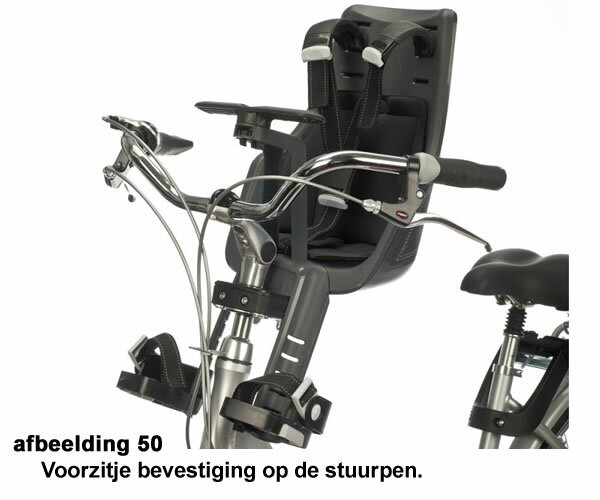 Protect the steel springs with special cases or replace the seat by a saddle with elastomer suspension. Child seats in which the child both behind and to the side is completely clamped are little fun for the child. Of interest is also the fit. The child must fit well in the child seat.